The standard-glass that should always be placed next to the wine glass. Due to its similarity to the wine glass, it also makes a perfect tasting-glass. Dimensions: 7- 7/10" H X 3- 1/4" Diam. The standard-glass that should always be placed next to the wine glass. Due to its similarity to the wine glass, it also makes a perfect tasting-glass. (One (1) glass per order) Crafted for water, non-alcoholic drinks, and particularly bitter beers. The work-horse of the gorgeous Zalto Denk'art line, this glass will finish any table setting in style as it serves up the more mundane libations. The shorter stem also makes this already very durable glass even sturdier. Interestingly, it has become the go-to glass for wine tastings, next to the Denk'art White Wine and Universal glass. 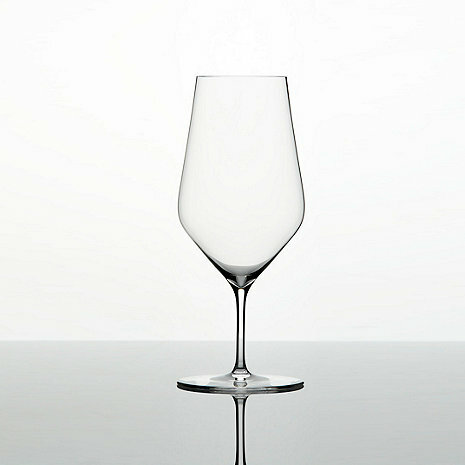 Technical perfection is the basic principle of the Zalto Glass Manufacture. Zalto Glasses have always been produced following a tradition of using only the most highly skilled glass-blowers working with a selection of the best raw materials. The curve of the bowls are tilted at the angles of 24, 48 and 72 degrees, which are in accordance to the tilt angles of the Earth. All Denk'art glasses are lead free. All Denk’art glasses are lead free. BEST ANSWER: Thank you for your interest. These glasses are very delicate. I do not suggest putting them in the dishwasher.